The African country of Côte d'Ivoire, or the Ivory Coast, is rich in oil, gas, gold, and diamonds. Oil and gas industry is quite developed to attract foreign investment. The country occupies a leading position in the world as an exporter of cocoa and coffee. It is not surprising that large amounts of international voice traffic are carried out in this direction. GSM termination in Côte d'Ivoire is a promising area of business as international calls are quite expensive, while prices for mobile communication are low within the country. Côte d'Ivoire has a population of over 23 million people. Mobile communication coverage in the country is much higher than the average for Africa. In the country, there are 19.8 million lines, which enabled it to take 49th place in the world in GSM coverage. Despite the fact that in Côte d'Ivoire, there are two competing local fixed-line operators, mobile communications providers dominate in the telecommunications sector. You can run a profitable VoIP termination business in Côte d'Ivoire by connecting your equipment to GoAntiFraud. Our integrated solution greatly reduces risks of SIM-cards being blocked by AntiFraud systems. We also offer NewBusiness packages available for beginners, including everything necessary for a successful start - SIM-lock protection tools, software for computerization and remote control of gates, as well as a set of VoIP equipment. In total, the market of the country is represented by 5 operators offering their services. Of these, the two largest are MTN (South Africa) and Orange (owned by France Telecom). In Côte d'Ivoire there are 3 mobile operators: Moov, KoZ, and Oricel. It is better to use the tariff plans of MTN and Orange for VoIP termination in this country as these two providers handle bog amounts of voice traffic, and this is an opportunity for a terminator to make more money. Of course, it is important to choose lucrative packages to minimize the business costs of mobile communications. 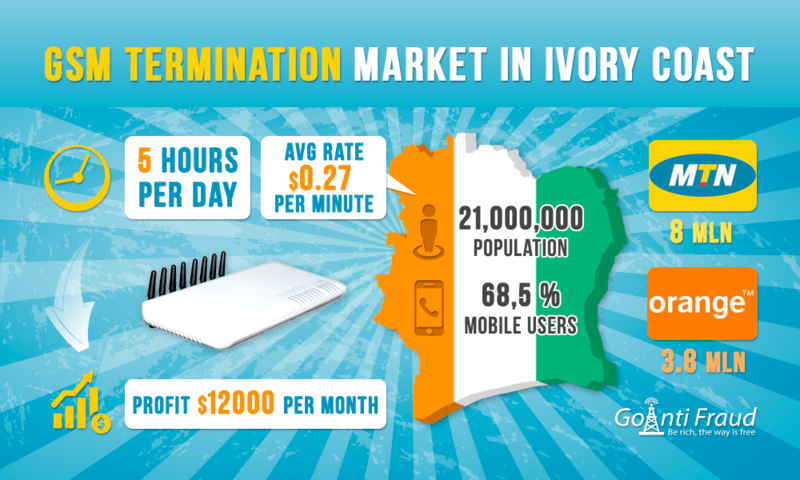 The average value of voip minutes in Côte d'Ivoire is $0.27. Using one eight-channel gateway for termination, which will work 5 hours a day, you will be able to land 2,400 minutes every day. Accordingly, a month income will be about 12,000 dollars, minus the cost of local calls and the Internet. VoIP GSM termination in Côte d'Ivoire can bring you a lot of profit if you provide your SIM-cards with protection from blocking. Proven tools from GoAntiFraud can simulate human behavior in GSM networks to efficiently disguise from the antifraud of mobile operators.